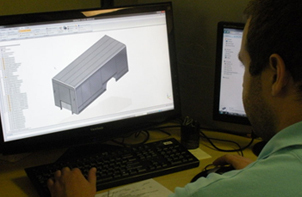 The Mickey Engineering Team is a collaborative group of degreed engineers and product designers with a wide range of backgrounds, experience and skills. This individual expertise, combined with a century of vehicle engineering and manufacturing innovation, forms the basis of Mickey’s unique Service Delivery Model, a chain of processes designed to turn a customer’s requirements into engineering solutions that meet expectations for strength, functionality, quality and appearance. The Service Delivery Model starts with a clear understanding of the customer’s business objectives and an accurate assessment of the specific vehicle’s operational environment. The final product is delivered on spec, on time and on budget. Using Solid Edge, a powerful computer-assisted design system with 3D solid modeling, Mickey engineers are able to do greater analytical work in a design environment by quickly assessing any variety of “what if” scenarios. This process allows the company to respond quickly and factually to customer inquiries regarding new features and feature enhancements for their delivery and specialty vehicles. The result is a much stronger, more durable product because all the components are designed, built and assembled in relation to one another. 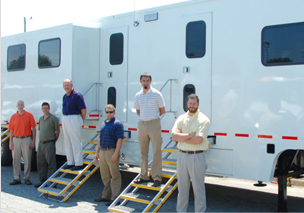 The “E” Team conducts extensive research on technology trends and continually evaluates technologies that help us build better, more cost-efficient, and durable vehicles.